No one likes being told what to do, especially when you are being told you are doing something wrong. This is why the topic of balanced technology management is not a popular one. 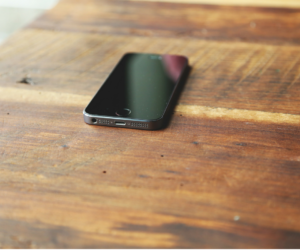 We all love our phones, computers, and TVs but we’ve become so reliant on these things for simplifying our lives and entertaining us that we are running in to many psychological, emotional, and physical issues from overuse. One thing you need to know about me is that I am extremely particular about the way run my life, but I am not judging yours. You want to spend 18 hrs a day behind a screen, go ahead! You want to give an infant a phone because it makes an easy babysitter, I get it! For the purpose this article, I want to highlight the data so that you can make informed choices, not chastise you. I am sure I ‘break’ several of these guidelines, but I am aware when I do and am comfortable with that. Considering how many kids are using tech daily, the guidelines seem very low, but the powers that be are trying to set kids up with healthier habits so those habits stick when they become adults. As today’s kids get sucked in to tech-use at a younger age, it starts to replace other activities that are social, educational, and physical. The Fear of Missing Out is the number one reason why people have difficultly putting their phones down. The internet never ends. Someone is also posting something new, online games have no start or end points, and it’s easy to fall down a rabbit hole of content for hours. This need to always be connected or in the loop causes varying levels of unhealthy anxiety. Setting limits on access time, especially for young kids, is crucial to helping avoid this. This is regrettably a very real issue today. The most susceptible group affected are males from 15-25 but this can affect anyone. I have previously explained how online gaming works, but for more information you can read specifically about tech addiction and its risks. Having spoken to a mom whose son had fallen victim to gaming addiction, this needs to be treated as a serious ailment. Advancement in society has replaced physical activity. We drive instead of walk, we buy groceries instead of farming, and sit behind computers instead of walking around. This has already put us at a disadvantage where we need to make an effort to find time to exercise. Take a look at your week and compare to the physical guidelines, kids aged 5-17 should be getting at least 60 minutes of moderate to vigorous-intensity physical activity per day. Adults aged 18–64 should do at least 150 minutes of moderate-intensity aerobic physical activity throughout the week. In addition to exercise, over-use of tech can have adverse effects on your posture, especially your upper back. I have personally spent the last year focusing on straightening out my back/neck from nearly 20 years of computer use. It has been a challenge and is ongoing. Setting up a good workstation, stretching, and taking breaks are key. Some people like to take a Digital Detox, which is where you go cold-turkey from tech for a set amount of time. Though this can be a positive solution for some, it is not a long term strategy that uses balance. Limit snacking at screens. This is twofold; the break from screen time, and better eating habits. Snacking while watching or playing leads to eating a higher quantity of food, and at a quicker pace, neither of which is healthy for us. 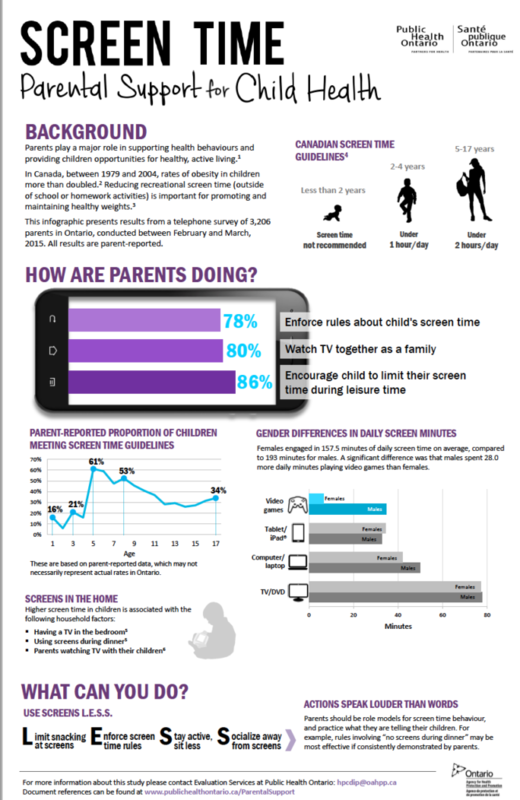 Enforce screen time rules. The earlier you can enforce rules with kids the better. It is always easier to extend a privilege than to take something away. Set firm times when you and/or your family can use devices, and other times when you cannot. We advocate for this in our device contract, and many monitoring software products also include the ability to turn off access at a given time. Remember to also give yourself one hour of screen free time before bedtime. Stay active, sit less. You don’t have to run a marathon, but try taking breaks for a walk on a nice day, or doing some housework. At work, get up and walk over to a colleague’s desk instead of sending an email, like the good old days! Socialize away from screens. In our home we have a rule of no devices at the table during meals to make sure we are talking without distraction. You can also try the game when out with friends where everyone has to put their phones on the table and the first person to check it has to pay the bill, or some other fun form of punishment. Institute a family game night instead of all watching a movie. Maybe you are a screen-less wonder, but if you think you may have more screen time in your life than you need, try one tip above for a week and see how it goes. All good things in moderation.